Last week, we learned about Coconut Palm sugar. Have you had a chance to try it? This all-natural sweetener is as sweet as sugar, has the same calories, a caramel-y flavor, a bunch of nutrients, and a low glycemic index of 35. It’s one of my favorite alternative sugars, but I know it’s not the only one out there. Today, we’re going to learn about agave nectar. It began gaining popularity about 5-10 years ago and is still a popular choice today. Lately, I’ve heard rumors that it may be as bad for you as high fructose corn syrup. Let’s take a look at agave nectar and learn some facts. 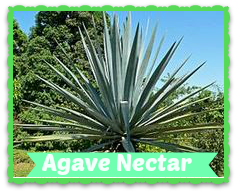 Agave nectar is made from one of over 100 species of agave plants. The most popular source is the Blue Agave plant, the same one used for making tequila. Although agave plants have been a source of food and spirits for hundreds of years, the “agave nectar” sweetener was invented fairly recently in the 1990’s. Despite it’s natural source, this sweetener may not be as “natural” as it is marketed. It must be refined to create the agave nectar. During this refinement process, the sugars are converted and concentrated. The end results is an all-natural, super-sweet syrup with a low glycemic index. But is it good for you? How does agave nectar compare to sugar? -Calorie-wise, agave nectar has about 60 calories per tablespoon (sugar has about 40 calories per tablespoon). -It is about 1.5 times sweeter than refined sugar. You’ll use less agave nectar to replace sugar, but you’ll end up with about the same number of calories. -Refined sugar is composed of sucrose (50% glucose, 50% fructose). Agave nectar is 70-90% fructose. In comparison, HFCS (high fructose corn syrup) is 55% fructose. More on this ahead. -Agave nectar is a slightly thick, syrupy liquid – a lot like maple syrup and a little thinner than honey. It is not a dry, granulated crystal like sugar, so recipe conversions can be a little tricky. -Agave has been used as an all-natural substitute for pancake syrup. -Agave nectar is vegan. Some sugar refining processes use charred animal bones for charcoal filters. It’s also a good vegan substitute for honey. “Agave nectar” is man-made. The process begins with the agave plant. When the plant has matured 7-14 years, the leaves are removed and the core of the plant is tapped. The plant’s natural liquid sap, known as the aguamiel, collects in the core. This is the raw, base material for the man-made nectar. From here, the liquid is harvested and sent for processing. You may have seen “raw” agave nectar in the store. Raw agave is made the same way listed above but using the enzymatic option to convert the fiber to fructose instead of the heat option. Raw agave retains the aguamiel’s original enzymes but has the same sugar profile otherwise. In the end, man-made agave nectar is up to 90% fructose. 90%?! So, here is our quandary. Agave nectar has a nice, low glycemic index of 30. This means it doesn’t spike your blood sugar – normally a good thing! Right? The dark side of agave is its massive fructose concentration. Why is this a bad thing? -Unlike other forms of sugar, fructose is exclusively processed by your liver. It’s not happily distributed around our body like glucose. -Studies have shown that large amounts of fructose cause an increase in blood triglycerides, higher LDL cholesterol (that’s the bad kind), fatty liver syndrome, higher blood pressure, metabolic syndrome, and glucose intolerance. -Your body has no specific need for fructose, unlike glucose which is used by every cell in your body. -Studies comparing increased glucose consumption vs. fructose consumption showed equal weight gain, but the fructose group gained it differently, concentrating it as visceral fat (think beer belly). More visceral fat is linked to tons of health problems including insulin resistance and dementia. Here’s the thing. There’s no denying that lots of fructose is terrible for your health. Agave nectar is a concentrated source and has more fructose than high fructose corn syrup. If you wouldn’t use high fructose corn syrup in your food, then definitely think twice about agave nectar! Are you already using agave nectar as a “healthier” substitution for refined sugar? What do you think about its fructose content? As with coconut sugar last week, let’s note that agave nectar is still a form of sugar, despite what its alternative marketing may suggest. If you’re aiming to improve your health, cutting back on sugar…all forms…is the best bet. Although this alternative sweetener offers a lower glycemic index, it may still have an undesirable effect on your insulin resistance. We’re wrapping up our journey through the sugar aisle with the sugar alcohols (xylitol, erythritol). These have always been a little mysterious to me with their artificial-sounding names and interesting health claims. We’ll take a look at how they’re made and if they’re a good sugar alternative for you.